Moosehide is ultra soft, yet one of our most durable leathers. This classic moccasin design is great for the guy that needs style but with a little added durability. 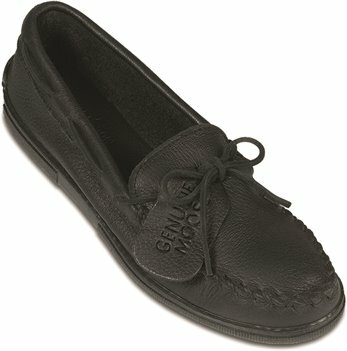 (IIThis moccasin is the best!Through the years I've purchased several pair and they always live up to expectation. My moose skin moccasins are the most comfortable shoes I have ever worn!!! This is my third pair!! Second Pair now. This is a quality shoe. The problem is exact size. The size is pretty true, but my problem was getting the right length vs. width. Now have sent back the 3rd pair. Ex. Size 12 was wide enough but way to long. Size 11 wide, and 11 1/2 wide is EXACTLY the same shoe in terms of length and width. So..... Now I have to decide whether or not to keep the slightly small and slightly narrow 11 1/2 or just get my money back, after the 4th mailing of shoe sizes. ?????? What to do. This might help you. I have found that the shoe will stretch considerably because it is soft yet tough leather , and it is the most comfortable loafer I have EVER worn. Moose is the softest and most comfortable possible. I used the first pair for a clean up house shoe, and it is like new after 3 years. I'm going to use this one for the street. Time will tell. Too soft. Would not hold its form. Returned. Very nice leather and very comfortable. True to size and stylish. Would recommend to others. Nice she. My husband loves these moccasins! I have been buying them for years, in both black and brown. He wears them every day to work. He literally wears out the inside of the shoe before the outside. They are very comfortable and high quality. Possibly the most comfortable shoes I've owned! The soft leather seems to enclose your feet and you hardly know that you are wearing shoes. I love 'em!!! I have bought Minnetonka moccasins for my husband for years. Wonderful shoes. I have been purchasing these Moosehide moccasins for my husband in both brown and black for many years. I have tried to purchase other shoes, but he won't have it, he loves them. He wears them every day, all day. When we get a new pair, the old pair then becomes lawn shoes. I am giving it a five star rating, but the inside of the shoe always wears out before the outside. Lately, I have bought a pair of inserts when I buy the shoes to extend the wear time. They are really classy shoes and do not go out of style. These moccasins are perfect. They are so lightweight and comfortable it feels like a glove on your feet instead of a shoe. Simply the most comfortable fit possible. Thank you Shoeline! These shoes are very comfortable I have had 3 pairs of this style. I am diabetic so I have to be concerned about a good fitting shoe. The leather is very soft and pliable. This company ships immediately very pleased. GOT WHAT i WANTED HAVE OTHER COLORS IN SAME STYLE WOULD USE YOUR SITE TO ORDER AGAIN VERY SATISIFIED. Nice product. Too bad it’’s not made in the U.S.